March 25th is Greek Independence Day, so how about celebrating by making some labneh? Labneh (pronounced LOB-nay or LOB-neh) is Greek yogurt cheese: cheese made from yogurt. The cheese preserves yogurt’s distinctive tart taste. Although it can be called Greek yogurt cheese in the U.S., labneh is popular throughout the Eastern Mediterranean and Middle East. To make labneh, yogurt is strained to remove most of its whey, resulting in a thick consistency, not unlike ricotta. Once the whey is removed, the firm yogurt solids (curds) that remain are called cheese. While the labneh is served here with traditional Greek crudites, you can substitute or add whatever you like. Unlike Greek yogurt, labneh is used as a spread, commonly served with pita bread, toasted flatbread and crudités (raw vegetables). This recipe is excerpted from Syria: Recipes for Olive Oil and Vinegar Lovers, by Emily Lycopolus and D.L. Acken. Reprinted with permission of TouchWood Editions via Lucero olive oil. 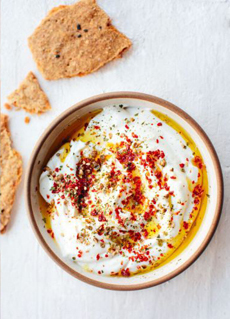 Here are more ways to use labneh. 1. MAKE the labneh. In a large bowl, combine the yogurt and the salt together, stirring the salt evenly through the yogurt. 2. FOLD the cheesecloth into a 16-inch square at least two layers thick. Spoon the yogurt into the center of the cheesecloth and pull the corners together. Tie the opposite corners together, not too tightly, so the yogurt can breathe, but tight enough that it will stay closed (photo #2). 3. PLACE the cheesecloth in a strainer with large holes over a large bowl and place a weight on top to help it drain. Let the labneh sit and drain for at least 12 hours, and no longer than 24 hrs. An alternative method from the author: Loop the knots over the tap in the kitchen sink, so the whey can easily drain. You don’t need to place a weight on top, but your sink is out of action for some time. You can do this in the evening and let the cheese drain overnight. 4. STORE: Spoon the thick mixture into a jar with an airtight lid. Smooth the top and drizzle the olive oil over the top to keep air from the labneh. Keep for up to 10 days. Note from the author: Harissa-infused olive oil can be quite spicy, so if you want to store the labneh, using the lime-infused olive oil instead. 5. SERVE: spoon the labneh into a serving dish, plate or shallow bowl. Drizzle it with additional olive oil, garnish with mint leaves, and serve with a plate of sliced radishes, cucumbers, olives, and flatbread..
Labneh is often served as a garnish, scooped into small balls and rolled in coatings of Aleppo pepper, chopped pistachios, nigella (onion seeds), sesame seeds, sumac or za’atar. These little balls used to garnish a bowl of soup, as a spread for flatbread, or to decorate a salad. 1. SCOOP tablespoons of the cheese into your hands and gently roll to form a ball. Then roll each ball in your coating of choice. 2. CHILL for an hour or two, or keep in an airtight container for up to 1 week in the refrigerator. 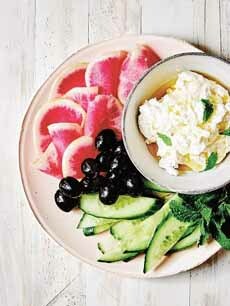 Homemade labneh with watermelon radishes, olives and cucumber (photo courtesy Emily Lycopoulos, Syria, Touchwood Editions). 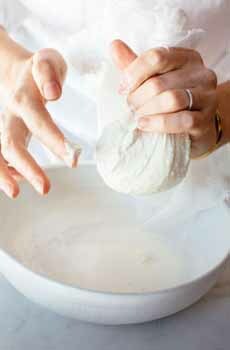 Making labneh (preparation step #2, photo courtesy Good Eggs). A sprinkling of harissa, a side of pita chips (photo courtesy Good Eggs)l.
 Harissa is a Tunisian hot chile spice blend that is often mixed with olive oil to create a paste. 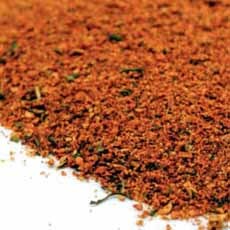 The main ingredients are baklouti pepper, roasted red peppers, serrano peppers, and other hot chiles, plus spices and herbs (photo courtesy Market Spice). Check out some other fresh cheeses, including creme fraiche, fromage blanc, mascarpone, queso blanco, queso fresco and quark.